The MassaSonic mPulse Model M-5000/220 Sensor is a short range, full featured, wired object detection sensor with multiple outputs. These sensors feature a high measurement speed and high accuracy. The mPulse incorporates state-of-the-art ultrasonic and microprocessor technology to provide precision non-contact distance measurement or object detection for factory automation or industrial process control. The mPulse Sensor stands out over all other systems because of its extraordinary ease of operation, genuinely user-friendly software, versatility in user-controlled outputs, and the ability to be set up without using a target. Contact a Massa Applications Specialist to discuss your specific sensing needs. The mPulse Sensor transmits narrow beam sound pulses at a user-selected rate (or it can be externally triggered), processes return echoes, and produces several outputs dependent on the position of the target. 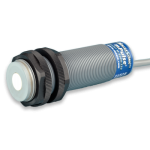 Operating from 12 to 28 V DC, these sensors provide non-contact measurement or object detection over a nominal target range of 4 inches (100 mm) to 40 inches (1 m). Outputs include a 0 to 20 mA or 4 to 20 mA DC analog current loop, two independent set-point switches, and echo status by both an LED indicator and an Echo Status Output switch. The system parameters and outputs are fully user programmable via an RS-485 data link, thereby eliminating the sealing and tampering problems associated with adjustment potentiometers or push-buttons. Some additional programmable features include: analog output slope, sampling rate, averaging of multiple target distance measurements, loss-of-echo time-out, and set-point hysteresis. RS-232/RS-485 converters. The RS-485 data link allows up to 32 sensors to be on the same multi-drop communications network. For users that prefer not to use a PC, the sensors can be programmed at the factory to the customer’s exact specifications for true “plug and play” operation. Other features of the mPulse Sensor include: industry standard 30 mm diameter CPVC housing, operation from -20°C to 65°C with built-in temperature compensation, diagnostic and monitoring outputs, and protection from over-voltage, short circuits, and reverse polarity.